The Intelligent Design Demi Ruffled Comforter Set will easily add grace and comfort to your bedroom decor. Beautiful flowing ruffles, in a soft blush hue, add charming appeal to the comforter and and coordinating sham(s). A solid blush reverse creates a clean look, while two decorative pillows with fabric manipulation and embroidery provide a touch of casual elegance to the bedding set. Made from ultra-soft microfiber, this printed comforter set is machine washable for easy care. Adorable in person. A little less true pink and a little more "blush"/light rose but certainly not coral or peach like all the others everywhere... Super soft material. Nice quality to the ruffle. Beautiful and quality detail on decorative shams. Love this, for the price especially. Love it. It doesn’t photograph well, but it is so cute in person. It is soft and fluffy, not too warm. My daughter is very happy with her “princess” bed. And Overstock has the best price for this set! Disclaimer- ruffles are only at the foot of the bed. Beautiful color and design. Matches my three year old daughters princess themed room beautifully. A great purchase, would definately recommend to a friend. Loved it, was baby pink just the color I was wanting. Very princess like. Very happy with it. Super cute and girly! My 4yrs old daughter loves it. The ruffles matches the theme in her room; she was very excited and couldn’t wait to get rid of her old crib comforter set, and has now transitioned into her “big girl” set. The material of the comforter is well made, soft, and warm. 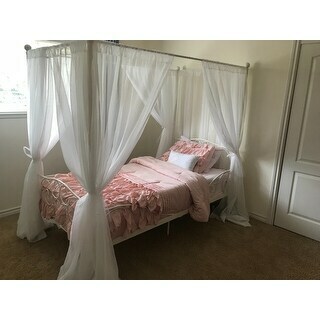 I bought this for my daughter and so far she likes the design and the color, pink. I currently looking for more matching items that would do this comforter set. My daughter loves her new comforter set. It makes her room that much more girly. She loves the ruffle detail and the accent pillow. The price was a good deal and it came in about a week. Love this bedspread! It is super soft and comfortable and wrinkle resistant! So great for my girls beds! Highly recommended! The material looks cheap, the color is NOT blush. It is PINK. Sooooo disappointed. There is blush then there is pink very different colors! comforter is smaller than I was expecting. color is what I expected and quality is nice. My daughter loves her bed cover it’s so girly. I recommend it. I feel like a princess, absolutely beautiful and well made. And the cost is unreal. Item arrived quickly. Purchased for our five year olds bedroom. She loves pink and really loves this comforter set. We would purchase again. My granddaughter loves it! Looks very feminine and it. Is easy to care for, just toss it in the laundry because 7 year old little girls aren't always too feminine! Gorgeous color. Very nice comforter for my 8 year olds room. "When will you have a king?" Color and design I was looking for, and price was great.